#1 How to Make Your Own First Aid Kit? Whether you live by yourself or with loved ones, it’s extremely important to have a first aid kit. After all, accidents or disaster could strike at any moment, and it’s better to be prepared than to have to face reality if an accident or disaster ever occurs. Nowadays, do it yourself projects are all the rage. Even though there are thousands of phenomenal first aid kits on the market, building your own first aid kit can be a fun task. So, continue reading to discover how you can build your own first aid kit in five easy steps! Does Anyone in My Household Have Any Medical Conditions? For example, if someone in your household has a severe allergy to something, you might want to consider carrying at least one EpiPen in your first aid kit. Where am I Going to Store and Use My First Aid Kit? There are a variety of places where you can store and use your first aid kit, such as your home, car, or boat. You could also choose to carry your first aid kit with you at all times, while you’re traveling, or while you’re doing a physical activity, such as hiking. Where you store and use your first aid kit will ultimately decide the size of your first aid kit, as well as what you put in it. What is the Weather Like in My Neighborhood? This might seem like a weird question to ask yourself. But, take a second and think about it. Someone who lives in a high-risk tornado area will probably want to include some tornado-safety materials, while someone who lives in a beach town would find these materials useless. So, consider what items you might want to include that are relevant to the climate and natural disasters that occur in your area. How Many People Could Potentially Use My First Aid Kit? This is another question that will help you determine what size you need, as well as what items you put in your first aid kit. If you live by yourself, you could create a small first aid kit that has general items. Even if you live by yourself, you should create a first aid kit that could potentially treat at least two people. On the other hand, if you live with five other people, you should create a fairly large first aid kit that has a variety of products and duplicates that could treat everyone. Once you consider your needs and desires, it’s time to start shopping for all your materials! Of course, you’re going to need a phenomenal container to store your items. After all, the container is the backbone of a first aid kit. So, it’s important you purchase a durable and reliable container. The type and size of container you purchase is ultimately dependent on where you’re going to store your first aid kit, how you’re going to use it, and who is going to use it. 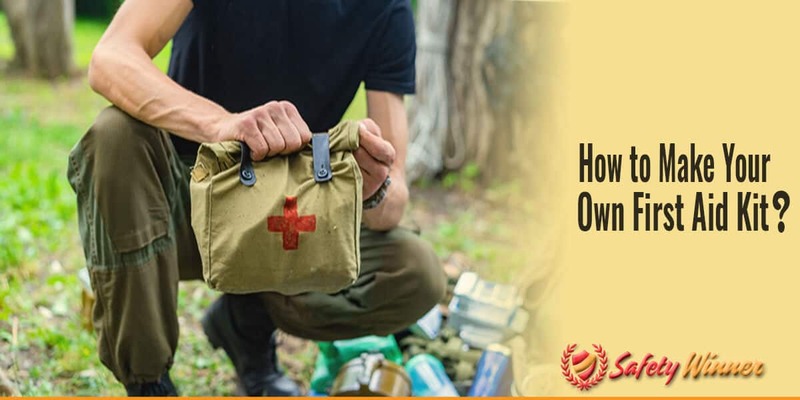 For example, if you want to build a first aid kit that is portable, so you can take it with you while you hike or travel, you should consider purchasing a small bag or case as your container. Walmart, Target, Marshalls, and Amazon are great places to find cute and reliable bags at an affordable price. On the other hand, if you want to have a massive first aid kit that has every type of first aid item you could potentially need, consider purchasing a traditional plastic snap-top container or a heavy-duty bag from a craft, office, or home supply store. If you plan on keeping your first aid kit in your home, car, or boat, you could even purchase a large plastic container from a superstore. Regardless of the type of container you purchase, it’s important you clearly label your first aid kit. Your first aid kit should have the first aid red cross on it. This can be sewn or drawn on. If you want to be extra safe, label your first aid kit with stickers or markers. A first aid guide that documents standard first aid procedures, which could ultimately help you save someone’s life. Various sized bandages to put pressure on and secure wounds. Bandages typically stop bleeding and protect wounds from possible infections. Sterile items, such as alcohol wipes, gauze pads, and ointment. These items clean and disinfect wounds, and ultimately prohibit infections. Bandaids to accommodate various minor injuries. Scissors to cut cloth, bandages, or other materials that are necessary when treating a wound. Tweezers to help clean and tend to a wound. Pain medicine to limit the amount of pain one feels from an injury. Gloves to keep everything sanitary and safe. This is where it gets fun! If you have any special conditions, are planning to use your first aid kit for a certain circumstance, or simply want to be as prepared as possible, here are some extra items you can include in your first aid kit!